Right now there are millions of children who are stuck in a failing education system. A system that is more focused on protecting special interests than providing a great education. For far too long, we've sat back and waited for answers. But our children cannot afford to wait any longer. 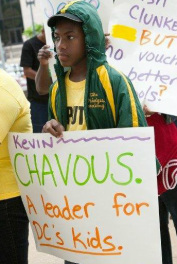 Join Kevin P. Chavous in the fight to provide every single child access to a quality education. No matter their zip code, no matter their parent's income, and no matter the color of their skin. It's time for every student in America to get the education they deserve.